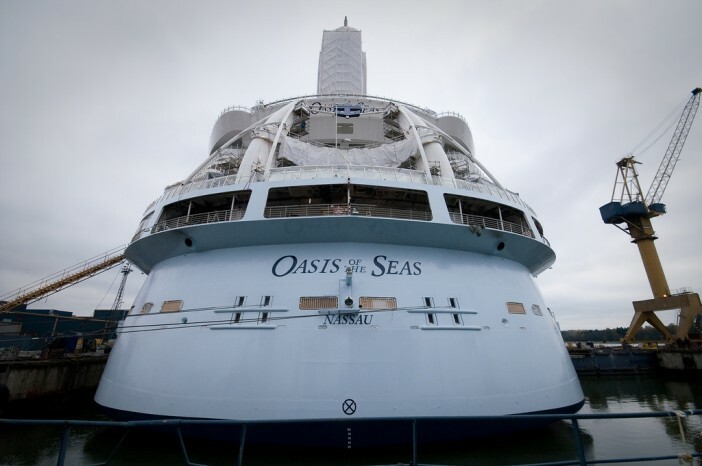 Welcome to the one-time world’s largest cruise ship – Oasis of the Seas. This magnificent ship will be visiting exotic locations around the world in 2014 and beyond – and Cruise 1st Australia has some of the best deals on our Oasis of the Seas cruise deals page. But keep reading to find out exactly why this ship is renowned across the globe. Oasis of the Seas is home to 16 decks, spans almost 362 metres in length and can carry 6,296 passengers (plus 2,394 crew) – and a ship of that size is always bound to be packed with exciting activities, top-class entertainment and plenty of opportunities to sit back and relax. Activities include a rock climbing wall, zipline which takes passengers down 9 decks, a surfing simulator and a state-of-the-art gym & fitness area. For rest and relaxation, try one of the many health and beauty treatments available in the Day Spa, or simply take a walk through the gardens in Central Park. And kids and adults alike will enjoy the DreamWorks Experience – where you can meet your favourite movie characters including Shrek and Kung Fu Panda. You can also watch DreamWorks movies on the big 3D screen, or in your stateroom if you’d prefer. There’s also a great programme of stage shows and performances to keep you entertained between stops at a variety of beautiful destinations. As you might expect from a ship of this size, there’s plenty of choice when it comes to dining. The ship’s many speciality restaurants offer a taste of cuisine from around the globe. That includes Izumi Asian Cuisine, which serves sushi and other Japanese specialties; Seafood Shack; The Chef’s Table, with service from your own personal chef; and Giovanni’s Table, which serves fantastic Italian food. There’s something to cater for all tastes here. The rooms on Oasis of the Seas are spacious and welcoming, even if you choose the most basic interior rooms. Standard amenities include a sitting area, TV, telephone and safe – and the smallest TVs on board are 32 inches, which is an indication of just how much attention to detail has gone into this ship! Outside staterooms are similar to the interior rooms, but provide ocean views. Balcony suites come with a private balcony and more space – perfect if you like to spend a bit more time in your room. The Suites and Deluxe staterooms are the very best rooms on board – with lots more space, fine attention to detail and several exclusive benefits, like priority check-in & departure and concierge service. To book your cruise, check out the latest deals on our Oasis of the Seas cruise deals page. Keep checking back, as we’re always updating our list of cruise deals.